I have to start this post with saying We Love Destination Weddings! It is a chance to venture out somewhere new and try crazy fun things amongst gorgeous scenery and landscapes. My favorite part is how everyone always has a great time, everyone gets to hang out and enjoy each other without the distractions of being at home. It brings weddings back to their roots of celebrating the nuptials of two people madly in love. Its a beautiful thing. 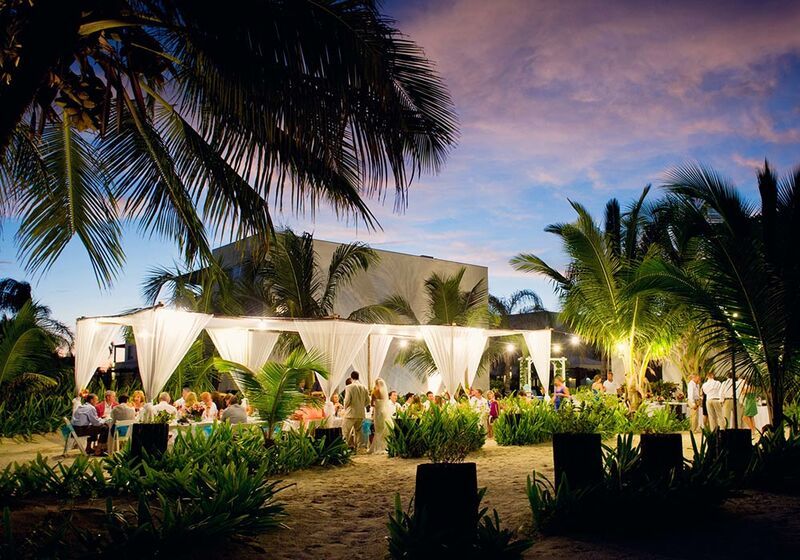 Now the beautiful beach sunset wedding ceremony and the outdoor beach reception help a little also. Check out this page for more reasons why I love destination weddings I honestly could have posted 100 pictures with ease for this post there were so many gorgeous ones but here are just a few of our favorites of the favorites! I love the different shades of blue for the bridesmaids dresses, they are multicolored dresses but they still match! The Groom and groomsmen’s beach attire was casual with the reef sandals but still very elegant. I love how everyone was barefoot for the ceremony. Such a comfortable mood it set. This is the perfect beach wedding. The flowers were very tropical, a good fit for a Las Terrazza’s wedding in Belize! Love the colors that the bridesmaids wore with the pop of pink in their bouquets! The first dance taking place at sunset on the beach.